← Fish, Which Is My Favorite Dish……. As we move along into the month of September in which I have featured quite a few wild game dishes, I got together with fellow Chef Jim Takacs and we decided to do a dinner party. But this was no normal dinner party because it was going to have a few interesting items on the menu. I thought the idea of doing something a little different would be fun. And since I still have a couple of products left over from my Fossil Farms trip, I was more than ready to get it rocking in the kitchen! So far I don’t think I have cooked anything extreme for you. I have done elk and deer meat which I don’t view as extreme game meat. But tonight I give you some thing different. Alligator. When most people I know here in NYC hear alligator meat, they cringe at the thought of eating it. It is viewed as a scary monster-looking reptile that will eat a human in a heartbeat. While this may be true, humans make more meals out of gators than they of us (which is extremely rare). Farm raising alligators for food has been around since the early 20th century, and the meat has been consumed by humans for centuries, especially in southern cooking. Now I know that so far I have not diminished the “ewwwww” factor yet in some of you, especially my daughter, but read on. Alligator meat actually looks and taste like chicken. I know you have heard this before but it is true. Alligator meat is lean, and is a more concentrated source of protein than some other meats. Like chicken, alligator meat is also low in fat and a good source of protein. The dishes I chose for “game day” were North African venison meatballs, which can be viewed HERE, and Alligator Etoufee. I mean, you don’t get any more Cajun than alligator. On a trip to New Orleans, my girlfriend and I went on a swamp tour in the bayou and actually saw people out hunting gators in the wild (post is here). Actually this trip was the very first time I’d eaten gator meat, and I liked it. I must admit it was a dangerous move to attempt to cook a meat I’ve never prepared before for a bunch of people that I would meet for the first time. But after watching the Giants beat the Eagles and my beloved Yankees kick the crap out of the Red Sox, I knew the day was off to a good start. Upon arriving to the dinner everyone was antsy to get it started since I was late (as usual). I was pleasantly surprised by the courses that were on deck. 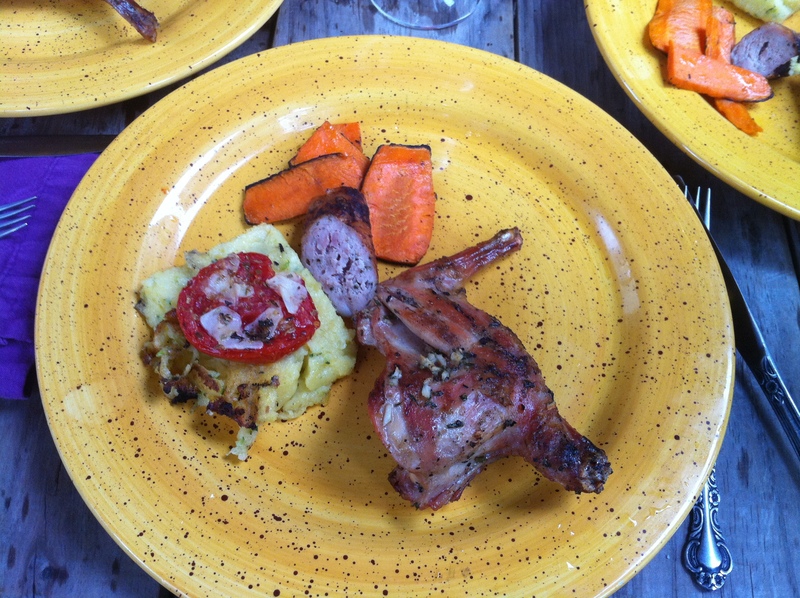 The first dish was prepared by Adam which was a freshly grilled rabbit marinated with olive oil, garlic and rosemary and served with a polenta that had fresh pecorino romano cheese and grated zucchini, topped with a roasted tomato with garlic and fresh oregano. This was an absolutely great dish, and we were off to a good start. Next up was the alligator (fingers crossed), Swoosh! I nailed it, and it had just enough Cajun “kick” to wake up everyone’s taste buds. 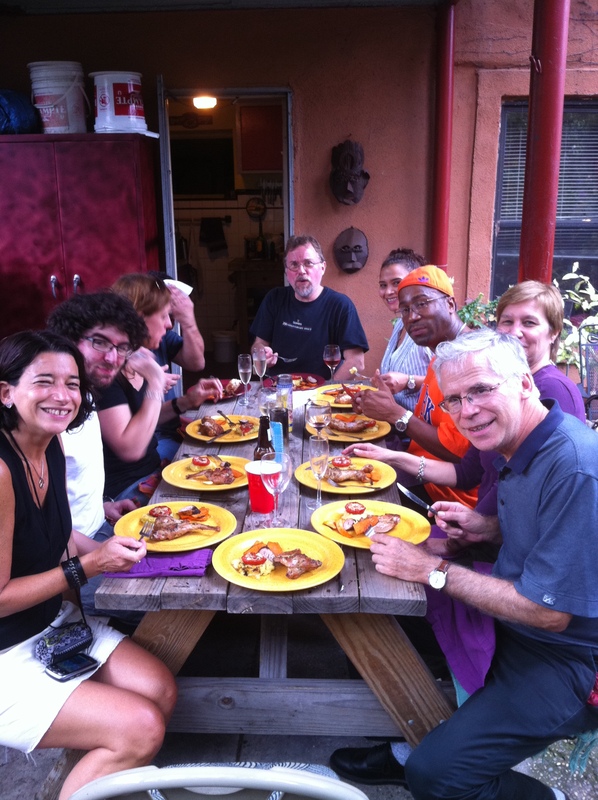 The meat was very tender and the Etoufee was very flavorful, totally Cajun! 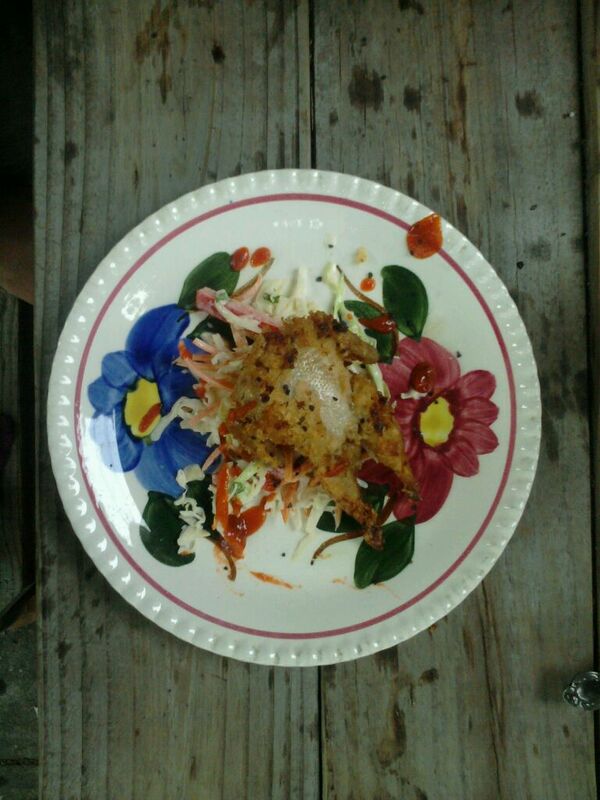 Next up Jim prepared panko crusted quail on ginger wasabi cole slaw and garnished with sriracha sauce, which I thought was a very clever and delicious dish. On to the venison meatballs that were definately a hit with its nice African flavors. Then Jim put out the last dish which was roasted shredded duck served with cashew butter and sorrano pepper jelly sandwich with an arugala, roast beet and fig salad. Yummy! 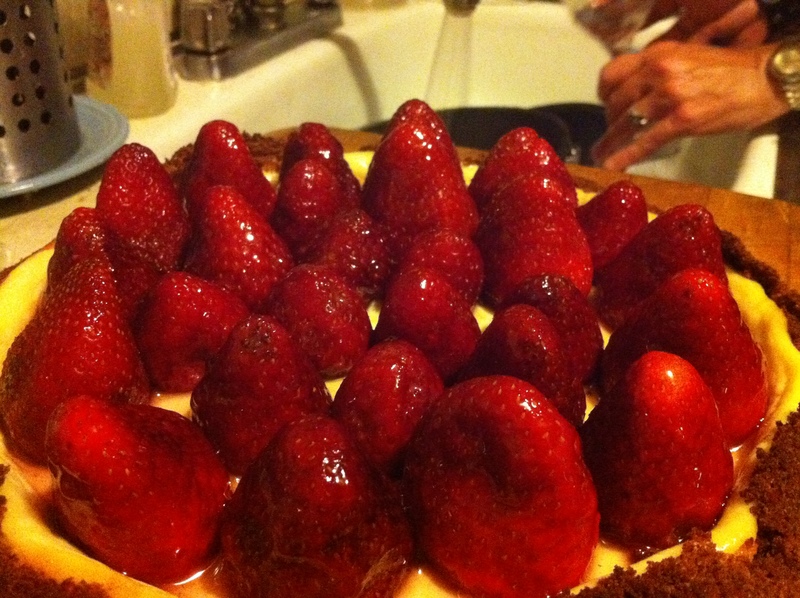 Carol wrapped up the night with her delicious strawberry cheesecake. It was so good that I wish I had grabbed a slice to go. Overall all of the food was fantastic, I had a chance to catch up with a childhood friend (Whaddup Kim! ), my NY teams ruled, and I ended my day happy. I wish every Sunday was this good. 🙂 Special thanks to Jim & Andrea for hosting, also Adam, Alyssa, Kim, Steve, Carol, and Jerry. Posted on September 27, 2011, in Wild Game. Bookmark the permalink. 6 Comments. Thank you Kim! Emily and I had such a great time with you guys! Impressive! I have to tell you, I’m from South Louisiana where Etouffe is scrutinized with severity…it’s an art form (one of many). Well, your etoufee looks PERFECT. Right color…right consistency. And the fact that you used Gator would gain you a LOT of friends down here on I-10!